The Parrs are back in Brad Bird’s Incredibles 2. Incredibles 2 takes everything you love about the Oscar-winning original and flips it on its head. The result is a highly-entertaining, slightly familiar tale with bigger action, interesting subtext, and all the smarts, heart, and laughs you could ask for. It’s Pixar doing what Pixar does best. 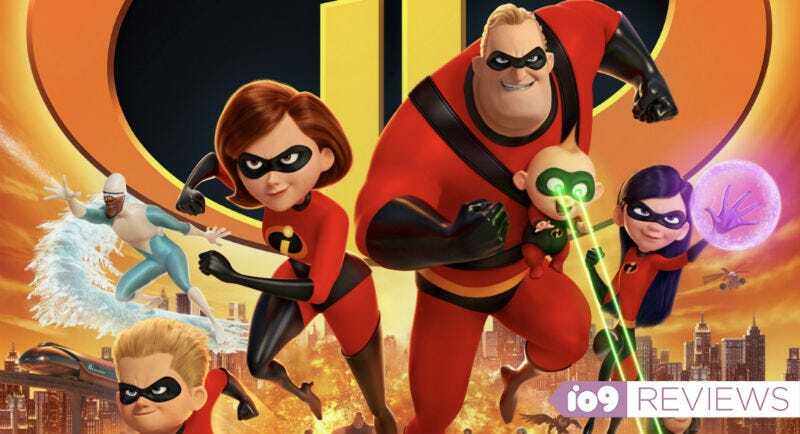 Much like the first film, Incredibles 2 is written and directed by Brad Bird and follows a parental figure going off on a mission to help someone with a superhero agenda. This time, though, all the variables have changed. The movie picks up right where the last one left off—but, instead of Mr. Incredible (Craig T. Nelson) leaving to go on a mission, now it’s his wife Elastigirl (Holly Hunter). And the people she’s working with don’t want to destroy all supers like last time, they want to bring them back and make being a superhero legal again. Though the ideas are similar, simply shifting the focus to Elastigirl opens Incredibles 2 up in amazing new ways. Mr. Incredible, the focus of the first film, is a fairly straightforward superhero. He’s a cool, confident white dude, and very strong. We’ve seen that many, many times before. Elastigirl, on the other hand, is simply more novel, and not just because she’s a woman. The way she stretches and contorts her body is a much less familiar power and, frankly, cooler to look at on screen than someone punching or throwing things. This is especially true in animation, where anything is possible. Elastigirl is the star of Incredibles 2, and the movie is better for it. As a result, when Elastigirl is recruited by siblings Winston and Evelyn Deavor (Bob Odenkirk and Catharine Keener) to help sway public opinion about the legality of superheroes, things almost instantaneously kick into high gear. Her first action scene, for example, is probably one of the best animated action scenes we’ve ever seen. It features Elastigirl, zipping through city streets on a motorcycle, trying to chase down and stop a runaway train. Nothing in the film ever tops that action-wise, but Bird and his team continually come up with new and wild ways for Elastigirl to transform and really extend, pun intended, her powers. Meanwhile, Elastigirl’s mission means that Mr. Incredible is at home watching their three kids, Violet (Sarah Vowell), Dash (Huck Milner), and the baby, Jack Jack. Staying on the sidelines is initially a blow to the ego of the patriarch but, quickly, he realizes being a dad can be equally as heroic as saving the world from bad guys. So, throughout the film, Bird cuts between these two forms of heroism, juxtaposing their struggles in ways the first film didn’t really get into. For Elastigirl, she can never quite do enough as a hero, while Mr. Incredible finds pleasure in the smallest things he can accomplish with his kids. Each character provides a new perspective on the tropes of parenting and being a superhero. If mom’s away, dad will... make breakfast and take care of the kids. Speaking of the kids, while Dash takes a bit of a back seat this time around, Violet and Jack Jack are arguably the best parts of the film. Violet’s journey through adolescence not only gives her a great arc, but some truly hilarious and embarrassing moments too. As for Jack Jack, the film continually plays with the story of figuring out what his powers are exactly, and the results are consistently surprising. He also has a run in with fashionista Edna Mode (voiced by Bird), which is always a delight. If Incredibles 2 was just about the family, though, it could feel a little stale. Thankfully, there’s a lot of things going on around them. There’s the questionable intentions of the Deavors, Frozone (Samuel L. Jackson) and his usual issues, as well as a new batch of superheroes who are hoping Elastigirl’s exploits will help them out of the shadows. Finally, there’s the Screenslaver, the mysterious new supervillain who controls people’s minds by taking over screens. All of those seemingly extraneous storylines not only end up weaving together beautifully, they give the film just enough thematic weight that you’ll have messages and mysteries to ponder in addition to enjoying all the action and goofs on screen. Really, the only negative things to say about Incredibles 2 are that, after 14 years, the opening of the film is forced to jam in a lot of narratives to catch everyone up, and the structure is very similar to the first film. Yes, this time we learn more about the characters; the world is bigger, the action better, there’s more going on beyond the screen, and the film is wildly entertaining throughout. But, despite all those things, at times the film can feel like a mere continuation or rehash of the first movie instead of an escalation or elevation of it. And those little asterisks are all that holds Incredibles 2 back from being a pantheon Pixar sequel. Elastigirl meets a bunch of new superheroes in Incredibles 2. The first Incredibles was one of the movies that really put Pixar on the map and, in the 14 years since its release, much has changed. Superheroes have become box office stars in ways they weren’t in 2004. Pixar has developed an almost unfathomable level of success and expectations, and sequels like this one are the rule, not the exception. All of which made it seem like Incredibles 2 could be the perfect storm for disappointment. Happily, that is not the case. It’s not just a great superhero movie, it’s a great sequel, and a great Pixar movie too. Incredibles 2 is an absolute delight that was worth the long wait. Incredibles 2 opens June 15.